Imagine eating frozen chocolate pudding...that's what this dessert is like. Strong carob, chocolate, and coffee flavors are prevalent, with a smooth, creamy, dense texture. For those new to carob, it has a chocolatey flavor with a coffee-like undertone...so the three main ingredients in this recipe pair perfectly together. 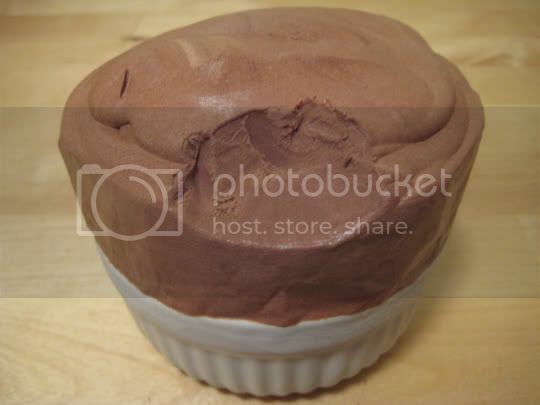 The "souffle" isn't terribly sweet, but its richness and strong cocoa/carob flavor makes up for it. I couldn't find Hip Whip, but instead used Tru Whip found at my local Whole Foods. Make again? Yes. I might halve the recipe next time. I made enough to (over)fill three 6 oz. ramekins...and I could only eat about a third of it at a time. It's rich!